There’s nothing quite like bringing your baby home for the first time. It’s your sanctuary, where you’ll settle into parenthood and where your baby will adjust to life beyond the womb. Here are three ways to get your place ready for your newborn. Yes, really! It may seem a little strange to baby proof your house – after all, newborns are usually immobile for at least six months, but there are a few things that you can do now to ensure your baby’s safety. Make sure all your smoke detectors are working, with fresh batteries. If you have gas or oil heaters, have them checked for leaks, and get carbon monoxide detectors installed. Ensure your changing table is sturdy and there are no dangerous objects within reach – it won’t take long before your baby is looking for distractions. Make sure there are no objects or toys in your baby’s cot or bassinet, or within reach. Curtain and blind pull-cords should be well out of reach, and secured with cleats or tension devices. Your home should be as natural an environment as possible, to ensure allergies and illnesses are kept at bay once bub comes home. Take a look at the paintwork in your house – do you have any peeling or chipped paint? Is there a possibility it could be lead paint? If so, get an expert in to check it out, and consider repainting with low VOC paint (which refers to the solvents released when painting). Next, look at your flooring. 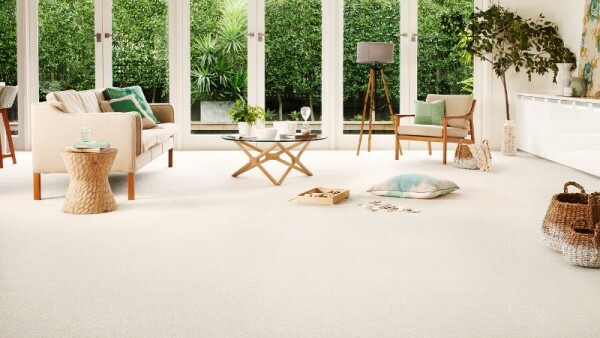 If your carpet is looking tired, it’s a great time to consider replacing it, particularly in the nursery. Not only will it freshen the room, but it will create a great starting point for decorating. And if you go for something from the Godfrey Hirst eco+ range, you’ll have the perfect flooring to take your child through childhood. That’s because any spills can easily be cleaned with nothing more than water. It’s also beautifully soft, so it will be comforting to play on (and gentle underfoot for you as you settle your baby). Try and buy household essentials each week, or when they’re on special in the months leading up to the birth of your baby. Things like toilet paper, cleaning products and of course baby essentials like nappies and wipes. Have a cupboard devoted to a small stockpile of non-perishable essentials that you can dip into over the first few weeks post-birth. Also, it’s a great time to stock up on little luxuries, while you’re still on two wages. So if there are things that give you much-needed comfort, buy them and put them away, you’ll be so thankful you did.